The Numbers Flash Cards 123 app helps your PreK, K, 1-2 children and students learn their numbers through visual and audio queues from 0-100. Features in-app coloring pages to trace numbers as well as the ability to print out. The flash cards include numeral and number word on the front with narration and tap repeat or tap for pronunciation only. These skill drill numbers zero through one hundred flash cards are perfect for number recognition and counting skills … skill building and test prep! 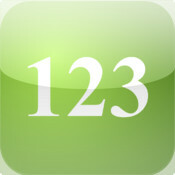 – Narration or Count to me: Follow along with proper pronunciation of the 123s as well as visually see the numeral and word number. Tap again to repeat pronunciation. – Tap or I’ll count: For more advanced children, this allows them to count to themselves or out loud as well as tap the page for audio queues to reinforce the learning process! – Coloring Activity Pages: Get interactive with your learning with in-app coloring activity pages for tracing numerals within the app! – Printable Activity Pages: Print out the activity pages to help trace numerals for even more hands-on learning! This is a very simple app and straight to the point! The narrator’s voice is good and easily understandable. I was reviewing the app with my baby right nearby, so she is already learning listening to numbers 0-100 without even knowing it! =) The Activity page is good with the different colors to choose from when writing them down. I believe it’s a neat feature to be able to email(share) the learner’s progress (without multiple sheets of paper lying around.) It was also a great idea to be able to print the pages in case the parent/teacher wants the learner to hand-write practice the numbers. In future updates, my suggestion would be to include another font or two of numbers on the Activity Page as not everyone learns to draw the number four like “4” as well as the numbers 1, 6, and 9 as they used on the app. So having a choice would be great in what style the parent/teacher wants the learner(s) to use. After developing Robot ABCs with Jinxie we decided to do a numbers app. But instead of going the robot way, we noticed a lack of simple flash card style education apps so that’s when we decided to go that route. Simple and to the point. The public launch was on December 18, 2012. How long did it take you to develop this app? It took a few months of on and off work. A lot of time and effort went into recording voices, syncing it sound up with the pages and general creation of the app. And the coloring activity took a while to get right too. The coloring activity for tracing is really useful to bridge the gap between visual and hands-on learning. Skill building for the early learnings. It’s a nice mix of audio/visual learning for those just being introduced to their numbers as well as a nice test prep for the kids who are catching on quickly to their 123s. Since there is audio, visual and a tracing activity it will be good for preK, K and 1-2. Possibly working on making it easier to get to the coloring/tracing activity for those who want to solely focus on that aspect. For those looking for a numbers app with lots of colors, animals, sounds interactivity, etc. please look for one of the other great options out there. This app was developed with the standard flash card style in mind.